In this post, we prove a theorem about a common segment between two segments. In the diagram below, and is a common segment to them. We show that if this is so, . 1. by Reflexive Property. A segment is congruent to itself. 2a. by Segment Addition Postulate. The Segment Addition Postulate states that if B is between and , then . 4. . Property of Equality (subtracting BC from both sides). 5. Definition of Congruent Segments. 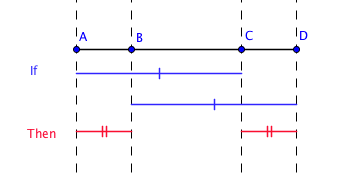 Segments whose lengths are equal are congruent.